A team of researchers has developed a light-activated switch that can turn genes on and off in mammalian cells. This is the most efficient so-called "optogenetic switch" activated by red and far-red light that has been successfully designed and tested in animal cells–and it doesn't require the addition of sensing molecules from outside the cells. "Being able to control genes deep in the body in a specific location and at a specific time, without adding external elements, is a goal our community has long sought," said Todd Coleman, a professor of bioengineering at the Jacobs School of Engineering at UC San Diego and one of the paper's corresponding authors. 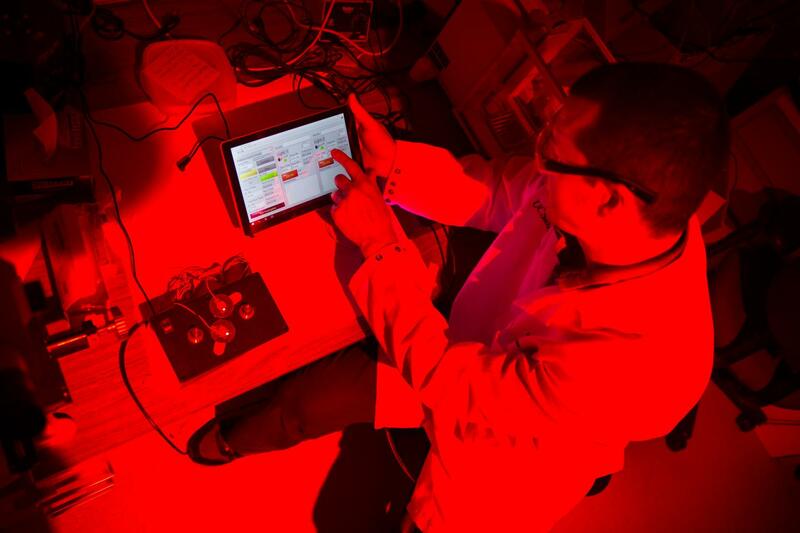 "We are controlling genes with the most desirable wavelengths of light." The researchers' success in building the switch relied on two insights. First, animal cells don't have the machinery to supply electrons to make molecules that would be sensitive to red light. It's the equivalent of having a hair dryer and a power outlet from a foreign country, but no power cord and no power outlet adapter. So researchers led by UC San Diego postdoctoral researcher Phillip Kyriakakis went about building those. For the power cord, they used bacterial and plant ferredoxin, an iron and sulfur protein that brings about electron transfer in a number of reactions. Ferredoxin exists under a different form in animal cells, which isn't compatible with its plant and bacteria cousin. So an enzyme called Ferredoxin-NADP reductase, or FNR, played the role of outlet adapter. The second insight was that the system to make light-sensitive molecules needed to be placed in the cell's mitochondria, the cell's energy factory. Combining these two insights, the researchers were able to build a plant system to control genes with red light inside animal cells. Red light is a safe option to activate genetic switches because it easily passes through the human body. A simple way to demonstrate this is to put your hand over your smart phone's flashlight while it's on. Red light, but not the other colors, will shine through because the body doesn't absorb it. And because it's not absorbed, it can actually pass through tissues harmlessly and reach deep within the body to control genes.